Join the ritual. 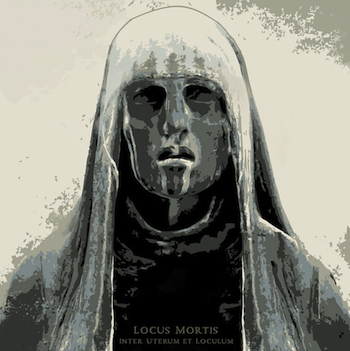 As a necromantic practice Locus Mortis unearth the vicious and morbid atmosphere of their debut album, sold out since 2005. The Gnostic path glorifying death and its symbolic meaning take the form of a completely re-recorded and re-arranged album. MZ, the musician behind Locus Mortis is also the mastermind involved on other well known proud acts like Arcana Coelestia and Urna. Locus Mortis moved their first steps into the Occult side of Black Metal in the wave contemporary to Watain and Funeral Mist being not affected by any compromise temptation. After many years those songs to be considered as classics for the Italian band are now ready to be emphasized to a wider and more effective level, spreading their inner black flame, lightning the human candles.